Who says you can’t throw together a gourmet recipe in 20 minutes? When you’re looking to add variety to your dinner routine, or impress your loved ones, try this dill cucumber sauce over your favorite piece of fish. 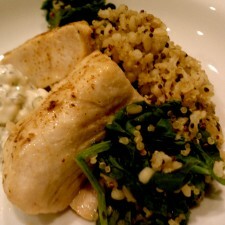 Last night, I used mahi and plated it on top of a bed of quinoa and pearled barley, wilted spinach, with the cream sauce on the side for garnish. 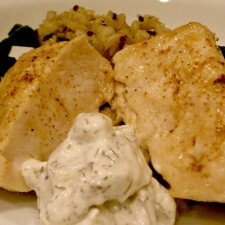 You can also use salmon for a more traditional salmon with dill cucumber sauce. This sauce is light, with no mayonnaise, horseradish, or sour cream but still very delicious. Boil 1 and 1/2 cups water, add 1 cup combination of quinoa and pearled barley. Boil for 2-3 minutes, reduce heat to low and cover. Simmer for 10-15 minutes or until the water is absorbed by the quinoa. Add 1 teaspoon garlic and 1 teaspoon coconut oil for extra flavor. When simmering, you can use this same pot to wilt the spinach or use a separate dish. Make sure to use a heaping pile of spinach as it cooks down to a smaller amount. Saute onions in 1 tbsp coconut oil over medium heat. 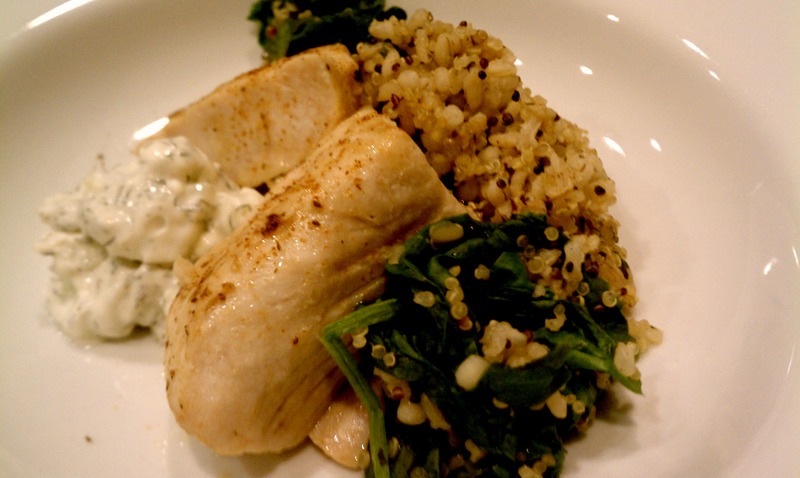 Generously coat your fish filets with lemon, coconut oil, and fish seasoning. I used just a sprinkling of Old Bay because it is very powerful. Place the filets in the sauteed onions and cook each side of the fish for 5-6 minutes. Flip regularly to make sure the fish cooks evenly on both sides. While the fish is cooking, mix1/3 cup cream cheese, 2 tbsp fresh lemon juice, 1 tbsp dried dill weed, and 1/4 cup freshly cut cucumbers with no skins. The cream cheese will easily mix with the rest of the ingredients even if it has been sitting in the refrigerator. Add 1 teaspoon of hot sauce if desired, mix thoroughly into sauce. Spoon onto fish after removing it from the saute pan and placing on dinner plate.